Head to your pantry or refrigerator and begin de-cluttering. Once you begin this process, you’ll likely realize that a substantial amount of your food isn’t being used (or won’t be used before its expiration date). Box the items up and deliver them to your local food pantry. Some food pantries might even have a pick-up service – just call! 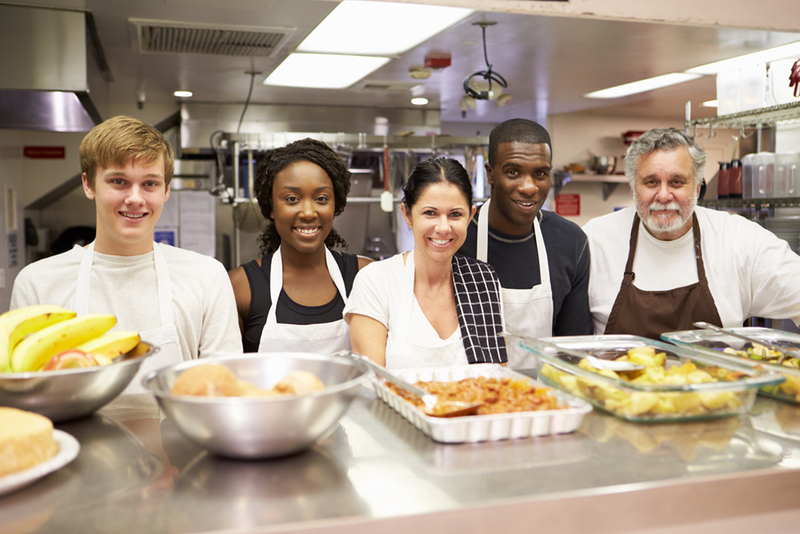 Begin volunteering at a local soup kitchen. 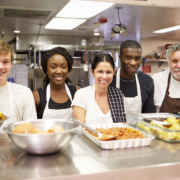 While you’re helping serve meals to those in need, you will also learn how to prepare meals in larger batches. This can ultimately come full-circle and further benefit food-insecure families. For example, try cooking slightly larger meals for your upcoming family dinners, then whatever isn’t eaten, plan on sharing with struggling families. You will never forget the feeling of helping fellow community members, just as your kind acts will never be forgotten by the individuals on the receiving end! Organize a canned-food drive at your office. Just imagine how much food would be gathered if everyone in your office de-cluttered their pantries and refrigerators! This would take merely 5 minutes of everyone’s time and has the potential to help feed multiple families. If you’re thinking ahead regarding ways to aid the hungry for months or even years to come, a community garden would be a great thing to get started on. Food-insecure individuals tend to have somewhat poor diets due to the high prices of fruits and vegetables, but with a community garden, all individuals have access to fresh produce. This not only addresses hunger, but it also promotes and fosters healthier diets. Hop on GetAssist today and see who else in your community would like to participate in starting a community garden! Take advantage of BOGO (buy-one-get-one) deals even if you don’t necessarily need the additional item. Let the items accumulate for a few weeks and then donate them to a local food pantry, soup kitchen, homeless shelter, etc. Ask your family and friends to do the same, and before you know it, you could become a main provider to your community! No matter your ambitions, GetAssist is ready to step up to the plate. As always, GetAssist has your back (and your community’s).